Then, in 1888, a yellow fever epidemic ravaged the Jacksonville community, leaving more children than ever orphaned and alone. Col. James Jaquelin Daniel, president of the Auxiliary Sanitary Association, and a well-known attorney and religious leader, worked tirelessly to combat the disease and coordinate volunteer efforts. Unfortunately, Daniel paid the ultimate price for his battle, catching and eventually dying from the disease. Financial contributions poured in from around the nation to build a “living monument” to his memory and the Daniel Memorial Association was formed. Daniel’s widow chose to honor her late husband’s passion for philanthropy and consolidated the Association with the Orphanage in 1891. In gratitude to the widow and respect for Col. Daniel, the Orphanage changed their name and incorporated as the Daniel Memorial Home for Children in 1893. During the next one hundred years, Daniel Memorial Home evolved to meet the changing needs of the community, altering its name twice in the process. Yet, throughout this slow metamorphosis, this philanthropic agency, now known as Daniel, continued to honor its namesake by remaining dedicated to improving the lives of community children. Now the oldest child-serving agency in Florida, Daniel helps nearly 2,000 children and their families each day with a wide variety of innovative and nationally-recognized programs. 1893 Daniel Memorial was incorporated as an agency. 1905 Daniel Memorial Home for Children moves to corner of Hubbard and Seventh Street. 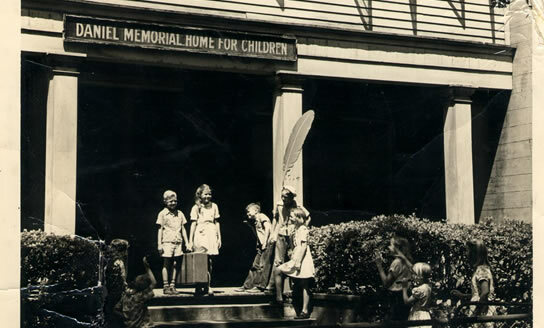 1928 State Welfare Board approved Daniel Memorial Home for Children to operate as a Child Care Institution. 1951 Daniel Memorial Home moved to 2500 block Riverside Avenue. 1953 A second home for boys was purchased on an adjoining lot. 1956 Foster care and family counseling services were added. 1968 Boys and girls cottages were built on ten acres on Belfort Road. 1973 Daniel Memorial Home became a residential treatment center. 1974 Dan Cook hired as president of Daniel Memorial Home. 1976 The word “Home” was dropped from the name to reflect a change in mission. 1979 A third 12-bed cottage was built on campus. 1981 The Therapeutic Foster Care program was implemented. 1982 The Therapeutic Group Home program (Mills House) was started. 1984 Daniel Memorial was accredited by the Joint Commission on Accreditation of Health Care Organizations. 1985 Children from the Northeast Florida State Hospital were transferred to Daniel Memorial. 1988 National conferences and catalog sales efforts launched. 1989 Daniel Memorial Institute, Hospital and Foundation were separately incorporated. 1992 Early Delinquency Intervention and Prevention program implemented. 1993 Community-based services in schools and housing projects developed. 1994 Statewide Adoption Information Center established. 1995 STARS, an employment agency for not-for-profits originated. 1995 The second Early Delinquency Intervention and Prevention program awarded. 1996 Youth Employment Services started. 1997 Daniel Payne Academy, a middle school for at-risk students, was launched. 1998 Daniel Memorial initiates a fund-raising and financial development program. 2000 Jim Clark promoted to President/CEO. 2000 Daniel was awarded the first pilot Statewide Inpatient Psychiatric Program (SIPP) in the state of Florida. 2001 Board Member Beth Sumner-Wiggins announces and initiates the Sumner-Wiggins Challenge, an endowment scholarship fund for Daniel kids. 2001 Daniel starts the Children Uniting with Parents (CUP) program, focusing on building positive family relationships between inmates and their children. 2001 Inaugural Daniel golf tournament fund-raiser event. 2002 SIPP program that started at Daniel in 2000 as a pilot is replicated across the state of Florida. 2002 Daniel is accredited by Council on Accreditation. 2003 Daniel launches its Community-based Care Program to provide foster care and adoptive services. Can Do program is expanded into two more Duval County schools. 2003 JaxBuild, a program designed to help youth learn a construction trade while obtaining a GED, is launched. 2005 Episcopal High School partners with Daniel to host inaugural six-week summer camp for emotionally/behaviorally-challenged children. 2006 Launch of Juvenile Justice Prevention/Aftercare Program in Daytona, Jacksonville and Tampa. 2007 Board of trustees unanimously votes to renovate/remodel the Daniel Belfort Road campus. 2007 Daniel launches a building endowment fund to ensure future capital needs will be funded. 2008 Community Based Intervention Services (CBIS) is developed and launched in Clearwater, Florida. 2008 The Ladies Auxiliary Luncheon Fashion Show hosts Miss America 2008 and raises more than $50,000 for the campus Capital Campaign. 2009 Daniel celebrates 125th anniversary of service to kids with help of 125 local and national celebrities. Among those 125— Bryant Gumbel, Wayne and Delores Weaver. 2009 Glyn Cook Memorial Scholarship founded to honor former Daniel Chairman of the Board Glyn Cook. Jacksonville Backyard BBQ Championships created as an annual fund-raiser for the Scholarship designed to help Daniel kids fund college education. 2009 Daniel is named as the first recipient of the annual donation from the volunteers of The Players. 2010 Daniel breaks ground on first phase of Capital Campaign – a new education center at the Belfort Road campus, which will serve on-campus youth and community foster children. 2011 Daniel’s Clearwater location partners and moves into a brand new facility owned by the Salvation Army. 2012 Daniel celebrates the opening of the new 12,083 square foot Education Center at the Belfort Road campus. 2014 Daniel Memorial, Inc. achieves national re-accreditation through the Council on Accreditation. The detailed review and analysis of Daniel’s programs and services as well as administrative practices resulted in full compliance of best practice standards. 2015 The Department of Children and Families renewed and expanded its contract with Daniel Memorial, Inc. To operate Florida’s Adoption Information Center for up to an additional 10 years as well as to create and operate a Statewide Independent Living Resource Center. 2016 Daniel opens a six-bed Respite Home program in partnership with Lutheran Services Florida (LSF) to provide respite for children with severe mental health and/or behavioral health issues. The short-term stay provides children with a structured, supportive environment and allows parents/caregivers a “respite” with the goal of reducing long-term removal of the child. 2017 Daniel begins offering Adult Mental Health services through funding by Lutheran Services of Florida. This program provides services to parents of children being served in the foster care system. Daniel was chosen as the only agency to implement a “Post-Reunification” program to provide intensive in-home services and support for recently reunified families for the purpose of preventing re-entry into foster care. The pilot is the only one of its kind in Florida. 2018 Daniel Academy extends to the seventh grade. Daniel receives its four-year re-accreditation through the Council on Accreditation (COA). Mills House reopens as a therapeutic group home in July.